In today’s address to the People’s National Congress Prime Minister Wen Jiabao outlined an ambitious agenda for the year with the official growth target unchanged from last year at 8%. In his address Wen ‘s rhetoric concerning cracking down on speculation, risky lending practices and excessive investment were sober but vague. 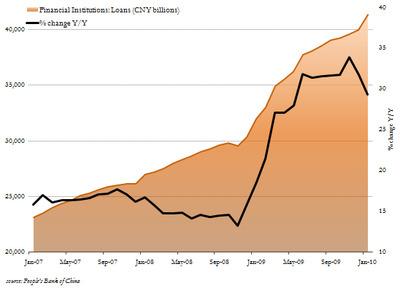 Taken at face value, The policy stance being put forward by Beijing should see lending curbed across the board –with the lending total new lending cap target for the year at 7.5 T Yuan (2.1 T lower than last year’s realised total), higher credit and risk management standards in the banking sector and more meaningful social spending (with a targeted 8.8% increase on aggregate for the year and 12.8% for rural specific programs). February new loans by the big four banks registered at a reported 38% month-over-month decline while total domestic lending may have halved. Although it is important to keep in mind that there is a significant skew to this data caused by the Lunar New year Celebration’s timing this year, the numbers still suggests that the consecutive reserve requirement increases in January and February have had a significant impact. · All media and anecdotal reports indicate that regional lenders have uniformly adopted the BOC’s tightened mortgage policies for first time buyers (although foreign lenders like Standard & Chartered continue to offer rate discounts). Another primary take away from a credit and regulatory standpoint is the impression that the government’s intent is to pragmatically use banking regulation to cool industries with excess capacity and over-invested asset markets (primarily real estate) while encouraging growth in deficient industries such as green energy, pharmaceuticals and information technology. Given that there is now a large professional class of US based wall street operators who solely promote investments in China, It would be our best guess that in the coming quarters these “favoured” industries will be an even hotter space for US IPOs and PE/Hedge Fund investments for the remainder of the year than they already are. One shudder’s to think of what new “Green China” stocks will be foisted on the public by the reverse-shell merger cowboys. A final data point from the conference that that intrigued us was an item in today’s South China Morning Post today. The paper interviewed CIC vice president Jesse Wang Jianxi who was in attendance at the people’s Political Consultative Conference. Wang said that CIC’s cash holding are “relatively low” and that: “If the government decides to give additional money to CIC, we will work out a new investment strategy. If not, we will make tactical adjustments and re-balance the asset allocation flexibly…”. Clearly, if Beijing is now intent on reigning in further spending by the state’s investment arm, the impact of the new regime of fiscal prudence will be felt in asset markets far from coastal Chinese cities.